This month, my fellow foodie was Vivian, over at Let’s Try These. She had all sorts of tasty recipes to choose from, including an Irish Potato Pie and Orange Tian that I almost chose. I ended up choosing to remake her Strawberry Rhubarb Crunch recipe. My mom had tons of plums dragging her trees down out front, so I decided I would help relieve their pain by making a plum crisp for dinner with my grandparents and family. I didn’t add water to the plum recipe, like she did in hers, because the plums release a lot of liquid when cooking. I also added pecans to the topping for some extra crunch. Turned out delicious, thanks Vivian for the inspiration! Combine the sugar and cornstarch in a large bowl, then toss with the plum halves and vanilla. Pour into a 11" round casserole dish. 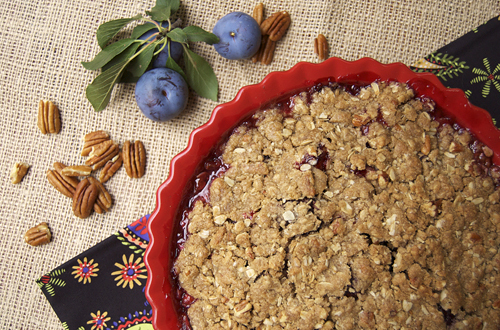 Combine the remaining ingredients and mix until a crumble is formed. Top the plums with the crumble mixture. Bake at 350F until topping is golden brown and fruit is bubbling at the edges (about 1 hour). Beautiful! I must go to the farmers market and pick up some plumbs, and then make this! 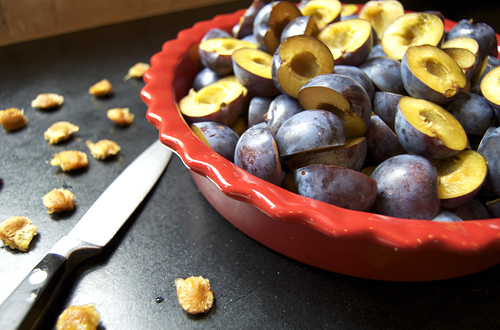 What a wonderful use for plums…. this looks amazing. Stunning pictures. I’m so hungry now!! Look at those plums! This looks like an amazing dessert! Yum!! Great pick! Crisp is always a favourite in our house, and this one sounds like a winner. Love the addition of pecans to the topping. What a great idea. I’ll have to sign up! I miss my mother’s plum tree. Last year was a stellar yield and then I moved away!! What a glorious way to use up a wonderful fruit. Love that you’re able to use freshly picked plums from your mother’s tree, what a treat. The pecans sound like a lovely addition. Fun being in SRC with you! This looks wonderful, what a great choice for SRC! 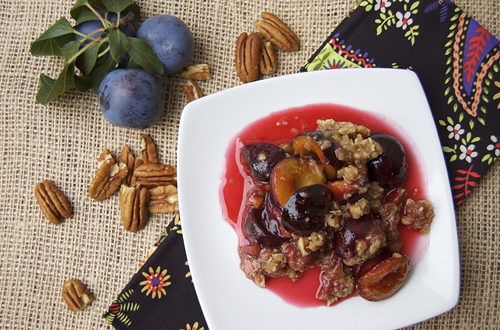 I have seen so many great sounding plum recipes recently. This is up at the top. Great SRC post. This sounds delicious. I just took a peach crisp out of the oven. It smells so good! What exactly is it about warm fruit that just smells like happiness? 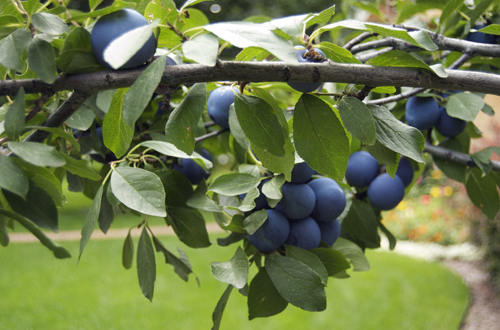 The plums look gorgeous and picking them straight from the tree…oh yes! Your plum crunch is just fabulous, wish I had a bowl full. If you haven’t already, I’d love for you to check out my group “A” SRC recipe this month: Welsh Cakes. Wow this plum crunch looks beautiful! Great choice! This looks so amazingly good. I’ve never done any baking with plums and this has me wanting to try! That plum crunch looks divine, nice way to bring the family meal to a close! Your photos are just beautiful! My husband loves plums I will have to make this for him! Looks great! I’m not a big fan of plums, but this dessert looks great! I wish I had a plum tree like your mom’s. You’re so lucky!! Beautiful plum crunch, great pick for SRC. Wonderful! This is a beautiful recipe….The MINUTE my blog is 6 months old, I’m applying! I love the SRC…..
What an awesome harvest dessert. It must be great to have this fruit readily available like that. And heck, I’m sure it’s appreciated that you offered to take some away! Plums fresh off a tree….wow! I’d love it if you’d stop by my SRC post for Turkey Sloppy Joes! Yum! Looks great — I’m loving SRC, so many great new recipes to try! Delicious! And so many more super recipes. This post will take some time for me. Love it. Beautiful SRC post! I am loving this club! And thank you for being a part of the SRC with me (group b). I am excited and looking forward to next month too! 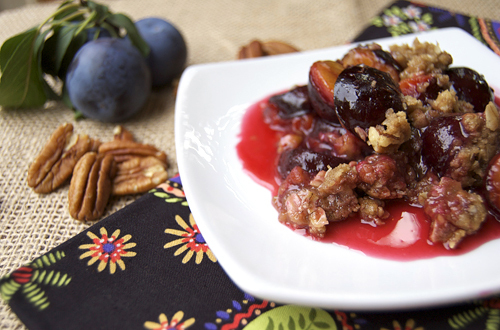 I think the use of plums is great and I’ve often added nuts to my crumb mixture. I’m glad you enjoyed looking through my blog. This hits all the right notes for me! I “plum” love it! Great SRC pick.